Some observers were surprised by the triumph of conservative candidate Andrzej Duda over incumbent Bronisław Komorowski in Poland’s May 2015 presidential election. Duda’s margin of victory, however, was thin: 51.5 percent of the vote against Komorowski’s 48.5 percent. 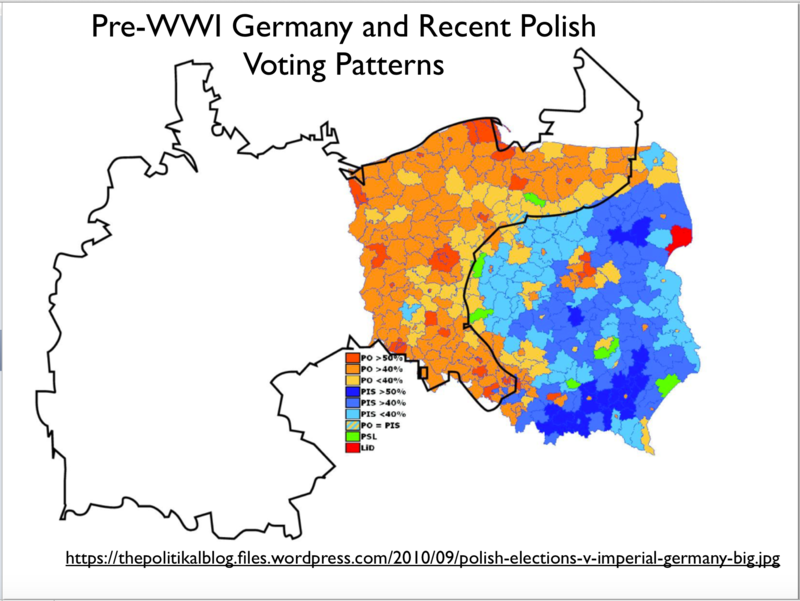 As is typical of Polish elections, the results were geographically patterned in a stark manner. Duda, like most conservative candidates, won almost every country in southeastern Poland, many by a substantial margin, whereas the centrist candidate Komorowski triumphed almost everywhere in the west and north. The few areas that Duda lost in the “greater southeast” are almost all major cites, such as Łódź, Warsaw, and Kraków, as would be expected, given the general left-voting tendency of urban dwellers (I have added the names of several cities to the Wikipedia electoral map to make this pattern clear.) The northwest/southeast divide, however, is still reflected in the urban sector, as the Duda did much better in such southeastern cities as Kraków and Lublin than in such northwestern cities as Poznań and Gdańsk. This geographical division in Polish elections should not, however, be exaggerated. Few areas, for example, saw an overwhelming victory of one candidate or the other, unlike the situation found in most elections in neighboring Ukraine. Over large areas of Poland, Duda and Komorowski split the vote relatively evenly, just as they did in the country as a whole. I begin to have doubts about the national integrity of any country when one political faction routinely gains over 80 or 90 percent of the vote over large areas, but that is not the case in Poland. Poland’s northwest/southeast electoral divide does not fit very well with the country’s socio-economic and demographic divisions. To be sure, western Poland is more prosperous than eastern Poland, a pattern that is masked on the per capita GDP map by the relatively wealth of greater Warsaw, which makes the voivodeship (province) of Mazovia appear richer than it would otherwise register. But note that Warmia-Masuria in the far north supported Komorowski despite being a relatively poor region, just as Małopolska in the far south supported Duda despite being a relatively well-off region. Population density plays even less of a role. 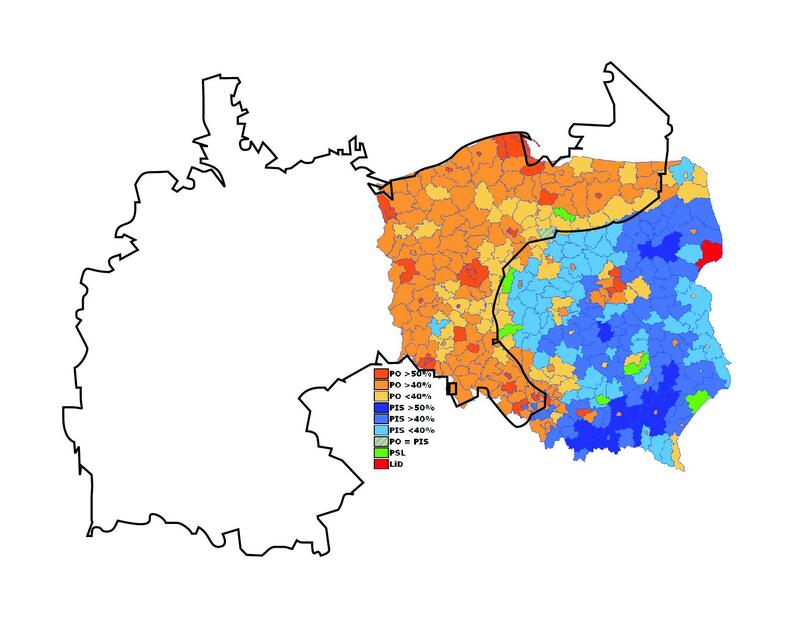 As the map posted here indicates, low-density regions are found in Poland’s center-voting western and northern peripheries as well as its right-voting eastern periphery. 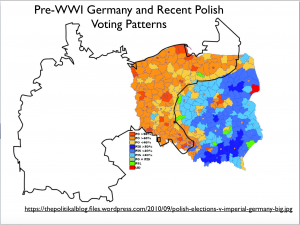 Instead, as has often been noted, Poland’s electoral divide is rooted in historical and cultural factors. The regions that generally vote for centrist or left-center candidates had all been part of Germany (and more specifically, Prussia) before World War I, whereas those that vote for center-right candidates had all been part of either the Russian or the Austro-Hungarian empire in the same period. 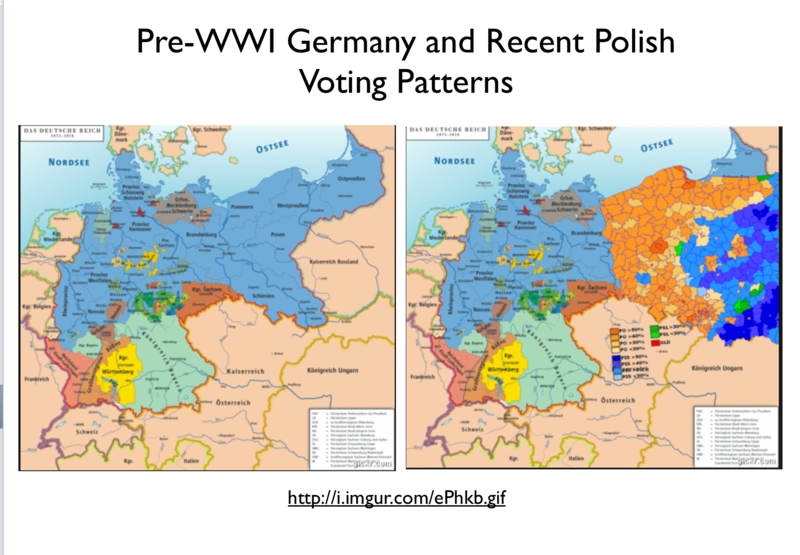 (I have posted two maps obtained from other websites (here and here) that illustrate this pattern from earlier Polish elections.) 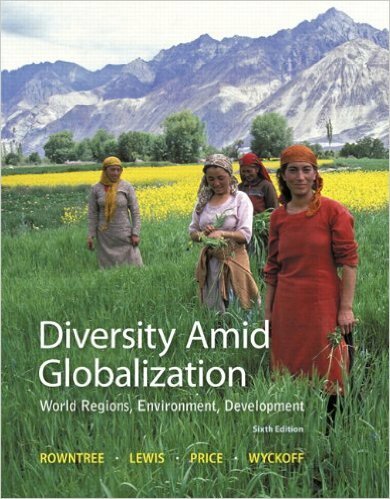 It is intriguing that this divide persisted after the massive population dislocations that occurred at the end of World War II, when millions of ethnic Germans were expelled from what is now western and northern Poland and replaced by million of Poles transferred from the east. 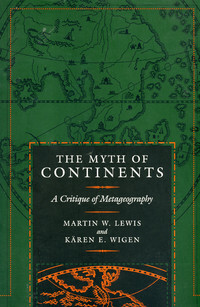 Perhaps political attitudes that had been established among the ethnic Poles who had lived under German rule spread among those who moved into the region after the war. 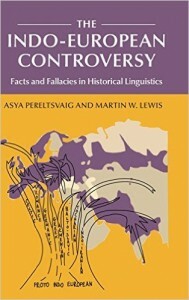 Such a conclusion, however, is little better than a guess; the issue surely calls for more investigation — or clarifying comments from informed readers! One largely rural area of eastern Poland, Hajnówka County, stands out for having strongly supported Komorowski. Hajnówka town is noted as the gateway to Biełaviežskaja Pušča, widely regarded as Europe’s largest “primeval forest.” Its distinctive voting pattern, however, is probably related to its large Belarussian population, which may be put off by the Polish nationalism and Euro-skepticism of Duda’s party. Whatever the cause, this region has voted in the same manner as Poland’s west and north since the transition to democratic rule at the end of the Cold War. Alongside German and Polish, many citizens of Opole-Oppeln before 1945 used a strongly German-influenced Silesian dialect (sometimes called wasserpolnisch or wasserpolak). 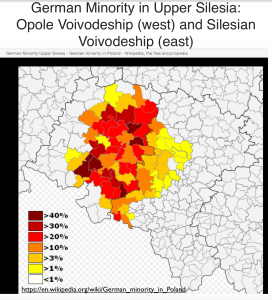 Because of this, the post-war Polish state administration after the annexation of Silesia in 1945 did not initiate a general expulsion of all former inhabitants of Opole, as was done in Lower Silesia, for instance, where the population almost exclusively spoke the German language. Because they were considered “autochthonous” (Polish), the Wasserpolak-speakers instead received the right to remain in their homeland after declaring themselves as Poles. Some German speakers took advantage of this decision, allowing them to remain in their Oppeln, even when they considered themselves to be of German nationality. Mr Kukiz stood as an independent ‘anti-system’ candidate. His background is as a rebellious rock singer who performed in a band called ‘The Breasts’, best known for their 1992 anti-clerical song ‘The ZChN (Christian-National Union) is coming’. The now-defunct Christian-National Union was a clerical-nationalist party which, as a member of Polish governments in the 1990s, promoted the Catholic Church’s social and political agenda. However, Mr Kukiz also professes a strong commitment to the Catholic faith, arguing that his best known composition was motivated by a desire to protect the Church from abuse by exploitative clerics. 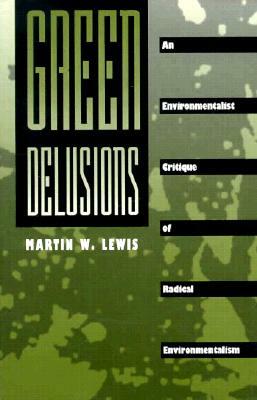 Indeed, in recent years he has been better-known as an advocate of social conservative and patriotic causes. In 2010 Mr Kukiz opposed a ‘EuroPride’ homosexual march in Warsaw and was dismissive of the election in 2011 of Anna Grodzka, Poland’s first transsexual parliamentary deputy, as the product of identity politics rather than ability. His musical recordings have also increasingly emphasised national-patriotic themes and he was at one time involved in supporting the annual ‘Independence March’ held on November 11th, the day that Poles celebrate national independence, which has come to be associated with nationalist groupings. However, describing himself ‘a right-winger with a left-wing heart’, Mr Kukiz also has a very eclectic approach towards socio-economic policy: supporting low taxes while positing an active role for the state in tackling poverty, and enjoying close links with a number of prominent trade union activists and leaders.